Increasingly sophisticated instrumentation for chemical separations and identification has facilitated rapid advancements in our understanding of the metabolome. Since many analyses are performed using either mass spectroscopy (MS) or nuclear magnetic resonance (NMR) spectroscopy, the spin ½ stable 13C isotope is now widely used as a metabolic tracer. There is a strong interest in quantitative analysis of metabolic flux through pathways in vivo, particularly in human patients. 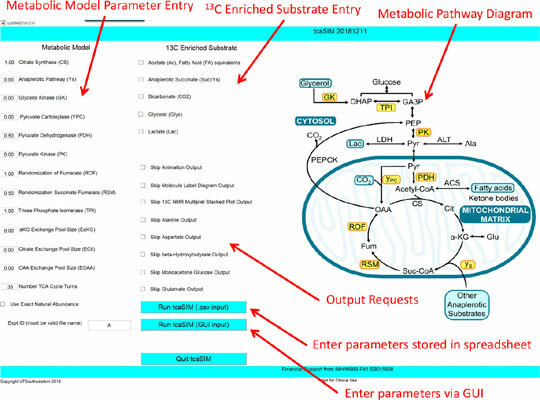 Although instrumentation advances and scientific interests in metabolism are increasing in parallel, a practical and rational design of a 13C tracer study can be challenging. Prior to planning the details of a tracer experiment, is it important to consider whether the analytical results will be sensitive to flux through the pathways of interest. Here, we briefly summarize the various approaches that have been used to design carbon tracer experiments, outline the sources of complexity, and illustrate the use of a software tool, tcaSIM, to aid in the experimental design of both MS and NMR data in complex systems including patients. tcaSIM, Metabolic flux, mass spectroscopy, NMR, simulation, optimal design.